Love is in the air as Cupid visits DinerTown and Quinn starts planning her wedding. With the magic of Cupid`s love arrows, anything can happen! 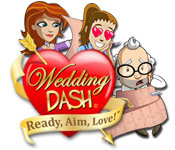 Take control of planning each wedding and meet the couple`s desires in Wedding Dash: Ready, Aim, Love! Use your Time Management skills to match the right guests together at the new cocktail tables to earn a love bonus, but watch out for dastardly wedding crashers!